January 14, 2011 | katie m.
I believe I’ve mentioned how much I enjoy Michael K. for my daily gossip and sass. Well, homegirl is tired. I think the plaid was the only thing that got me through Friday … it was mostly successful: lesson plan, study, teach, cafeteria lunch, meeting, collapse. You got to know when to fold them. Which is why I’m watching Toddlers & Tiaras and thinking about bed, not wading my way through the rest of the 19th century. Who needs any more realism than reality television? I’m even too tired to knit. These exams have got to get finished soon. Anyway, the skirt: wool plaid from Joann fabrics, Simplicity 2698; zipper put in by a seamstress because my sewing machine was having none of it. This is no masterpiece of construction (except for the zipper) and is riddled with all kinds of amatuer mistakes, but it holds together, is cute and swingy and makes me pretty happy to wear. Also: how did I ever forget just how warm a stranded hat could be? I love the skirt! Great choice of fabric. Cannot see any mistakes myself! Love it! The skirt is perfect for winter, and I can see how it would get you through the day! Best of luck with the exams! Omg, you have a wool skirt! 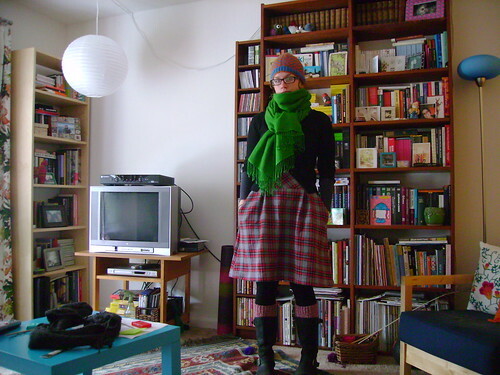 A plaid wool skirt! That’ll definitely get you through the winter. Hope your weekend was refreshing! I love all of the contrasting colors in your outfit, very cute! And your skirt is wonderful.